Beppe Colla died on January 15. Beppe was the patriarch of the Colla clan: Although mostly retired, he continued to advise his much younger brother Tino and his daughter Federica at their jointly owned estate, Poderi Colla. Before that, he had been the owner of the Prunotto winery and the winemaker who in the ‘70s and ‘80s guided Prunotto Barolo and Barbaresco to the heights of accomplishment and acclaim. He was 88 and, had he lived, would have enjoyed his 70th harvest this year. It is hard to overestimate Colla’s contribution to Alban winemaking, indeed to the whole Piedmontese wine world. He was one of the pioneers who opened the way for Barolo and Barbaresco to achieve the kind of fame they now enjoy. 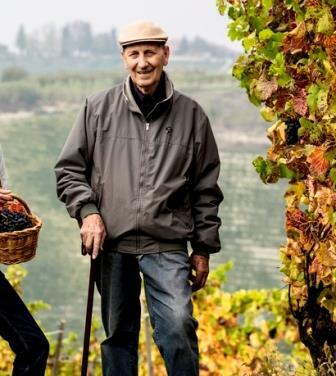 He made great wines before there was a single stainless steel tank or a notion of temperature-controlled fermentation anywhere in the Barolo and Barbaresco zones. He welcomed the new technology when it became available: At Prunotto, he used the first stainless steel fermenters ever seen in the Alba area. He made the first cru Barolos and Barbarescos, a then-heretical act for which he was at the time severely criticized by the local establishment. Along with Renato Ratti and a few other like-minded individuals, he founded the Ordine dei Cavalieri de Tartufo e dei Vini d’Alba, a group that is widely credited with having spurred the modern revival of Piedmontese gastronomy, which immensely benefited the whole zone and every hungry tourist who has ever visited it. At heart, for all his innovations and all the ways he altered the Piedmontese wine universe, Colla remained devoted to the traditional ideals of Barolo and Barbaresco: The wines had to taste first of the fruit and the soil, and of the technology never. At Prunotto, he crafted wines that became benchmarks of Barolo and Barbaresco. Even, I would add, of humbler varieties: I remember the incredible balance, intensity, juiciness, and encompassing elegance of the Barbera d’Alba that he drew from the Pian Romualdo site – Barbera that for my palate has not been equaled since, anywhere in the zone. Throughout his career, he remained an uncomplicated person, devoted to his craft and his family, plain-spoken and shy of personal publicity. I had the pleasure of talking with Beppe Colla many times, over a good many years, and I always learned something from him: He was a trove of wine lore and viti/vinicultural information. But my characteristic memory of him will always be a simple one: his shy smile of pleasure at the sight of someone enjoying his wines. We have lost many fine winemakers in recent years – Bruno Giacosa, Beppe Rinaldi, Leonildo Pieropan, Antonio Mastroberardino, and now Beppe Colla. We are witnessing the end of the heroic era of Italian wine. A generation of giants is passing. This entry was posted on January 28, 2019 at 7:00 am and is filed under Barbaresco, Barbera, Barolo, Italy. You can follow any responses to this entry through the RSS 2.0 feed. You can leave a response, or trackback from your own site. Lovely homage – truly a time of transition…young winemakers standing on the shoulders of giants and ushering in another revolutionary era!